Smoking and booze are notorious for topping the list of harmful behavior across all generations. But today, Generation Y have their own unique challenges to having a balanced and healthy lifestyle. Many of the unhealthy habits of millennials are borne out of the advancements in technology that provide limitless possibilities. Technology misused has its negative effects on health; knowing about them, whether you’re a millennial or not, will help you avoid those behaviors and allow you to live to old age unencumbered by illness. Millennials know what a healthy meal consists of: lean meats, starch, fruits, vegetables and salad. But their actual diet has too much red meat and greasy foods but few fruits and vegetables. Young adults’ propensity for multitasking will develop cognitive skills and patterns of thinking will have a positive change. But the ready availability of information will also lead them to expect instant gratification and hinder the ability to think deeply and look for solutions. Being on the internet discourages face-to-face interaction and inhibits development of social skills. Who would think that chairs, those inanimate objects used for sitting, could kill us? According to Dr. James Levine, director of the Mayo Clinic-Arizona State University Obesity Solutions Initiative and inventor of the treadmill desk, “sitting is the new smoking” and it is deadlier than HIV or parachuting. Young people between the ages of 18 to 34pend hours of every day glued to their computers and yes, sitting. And according to some scientists, this non-activity ranks first in the unhealthy habits of millennials. Whether it’s work (most IT professionals are born in the 1908s to the 2000s) or play (gaming is their number one pastime,) prolonged sitting leads to obesity, heart diseases, high blood sugar levels, high cholesterol levels, and muscle and joint pains. Any of these medical conditions can disable you or kill you earlier than you think. The solution? Move around. Get up from your chair every hour. Walk or bike to school or work. Play real sports. Millennials are not sleeping as much as their older generations and one factor that contributes to this social and biological dilemma is technology. They were born when the internet, computers and cell phones were already around and they look at these things as a given, much as the baby boomers regarded radio and television. But with connectivity available 24/7, young people not only seek information and connection, they are also bombarded with it. A Pew Research Center study showed that more than 80 percent of people who belong to this age group sleep with their cell phones and 29 percent say they aren’t getting enough sleep. What this all boils down to is this vicious cycle: sleep deprivation causes stress causes lack of sleep and decreases efficiency and productivity. It also makes them more irritable and prone to anger, anxiety and depression. When cell phones are left on and by the bed, the blue light it emits upsets the body’s hormone production that is responsible for the biological clock running correctly. The mind too, even when asleep, is subconsciously aware that anybody could be tweeting or posting, creating unnecessary stimulation that interferes with sleep.So, turn off the iPad and the smartphone when going to bed. But, with millennials, is this even possible? 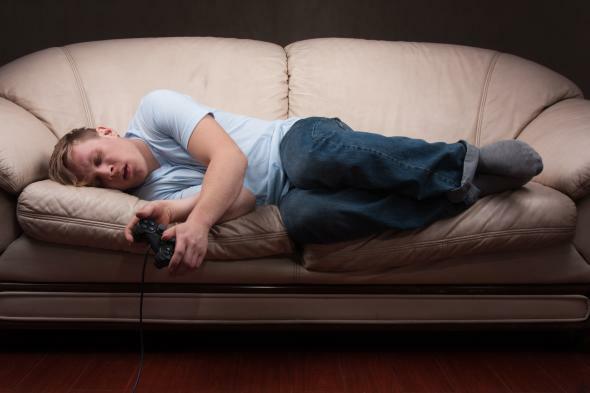 Playing video games for hours on end is not the exclusive domain of Gen Yers. The Generation Z kids (because that’s what they still are) can beat the millennials in this category. Gaming per se is not bad. It improves motor coordination, promotes quick thinking and problem solving skills and delays the onset of Alzheimer’s, although at their age, the disease may be the least of their concerns. Playing video games for more than two hours a day is considered excessive by some psychologists but the general consensus for too much screen time is when the activity starts affecting the health, school and social life of the gamer. Since video gaming is addictive, many players who start out casually soon increase playing time, oftentimes with disastrous effects. What makes video games harmful is their violent nature. A survey of video games show that 90 percent of them rated E10+ (suitable for general audience 10 years old and above) contain some form of violence. Extended playing affects blood flow to the brain frontal regions which control aggressive behavior, so that the player displays aggression even in real life. Relationships suffer as a result. Health problems include obesity, increased eating of unhealthy foods, backaches, eye strain and carpal tunnel syndrome. Performance in school and work deteriorates because of lack of sleep from playing video games and poor concentration.